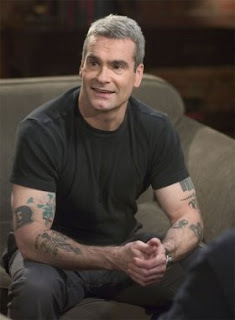 Hey, the next instalment of Henry Rollins's radio show is inspired by Rip It Up and Start Again! I knew he was a fan of postpunk (remember his far-ahead-of-the-curve reissuing of records by James Chance, Gang of Four, Devo, Flipper, Alan Vega, etc in the mid-90s via his label Infinite Zero?) but not to this extent: looking at the track list for the show, Rollins really knows the era inside and out. The show airs Saturday 25th April--tomorrow night--at 6-8 pm PST on the Santa Monica NPR station KCRW FM. As far as I can tell it can be listened to via the web live. It will also be archived online for several weeks thereafter.